Tamaño de esta previsualización PNG del archivo SVG: 500 × 600 píxeles. Otras resoluciones: 200 × 240 píxeles · 400 × 480 píxeles · 640 × 768 píxeles · 853 × 1024 píxeles · 600 × 720 píxeles. with this coat of arms. 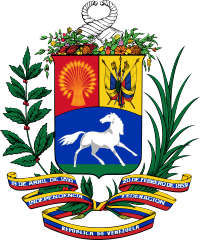 Véase también : en:Coat of arms of Venezuela. Véase también la categoría : Coats of arms of Venezuela. 19:16 29 ene 2019 600 × 720 (307 KB) FDRMRZUSA Corrected "trasparency effect" over "Republica de Venezuela. No other changes. 18:27 29 ene 2019 600 × 720 (296 KB) FDRMRZUSA Corrected yellow leaf in right branch. No other changes. 18:16 29 ene 2019 600 × 720 (296 KB) FDRMRZUSA Corrected imperfections in the coat of arms: horse's hoof and meadow. No other changes. 14:46 29 ene 2019 600 × 720 (299 KB) FDRMRZUSA Higher svg resolution from same file, resized by "Inkscape". 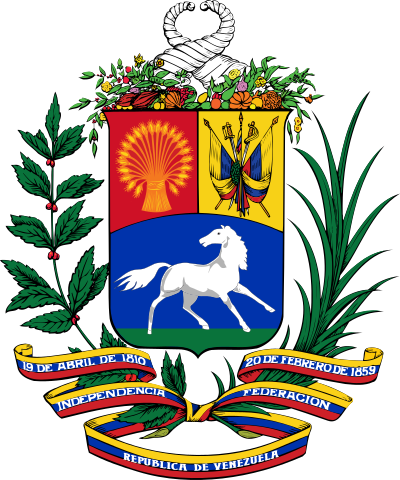 Corrected "white background" in the side over the shield (imperfections); added "meadow" in the shield, according, for example, to "File:Escudo Nacional de Venezuela (1954-2006).png". Optimized: reduced svg code and ckecked by "Commons svg checker" before upload. No other changes.